In the 1906/07 season, the Northern League opted to adopt “Amateur” status which meant a number of its clubs left to join the semi professional North Eastern League. This also heralded an up turn in Crooks fortunes, finishing 3rd in the league that season. In 1908, the club took the decision to turn professional and were indeed accepted in to the North Eastern League. However, on the eve of the new season and after a full review of the clubs current financial situation they decided to remain as an “Amateur” club and stay in the Northern League. 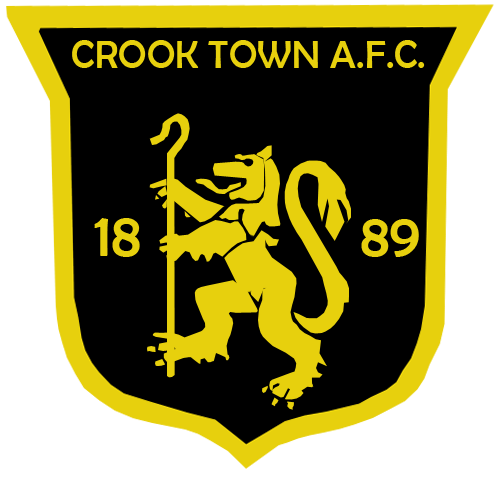 In 1912, Jack Greenwell, a local miner was part of the Crook Town team. He later decided to emigrate to Spain where he helped to establish one of the first Spanish football clubs called Barcelona. He was also instrumental in organising a tour to Spain by Crook Town where they played a series of three games against a fledgling Barcelona team. 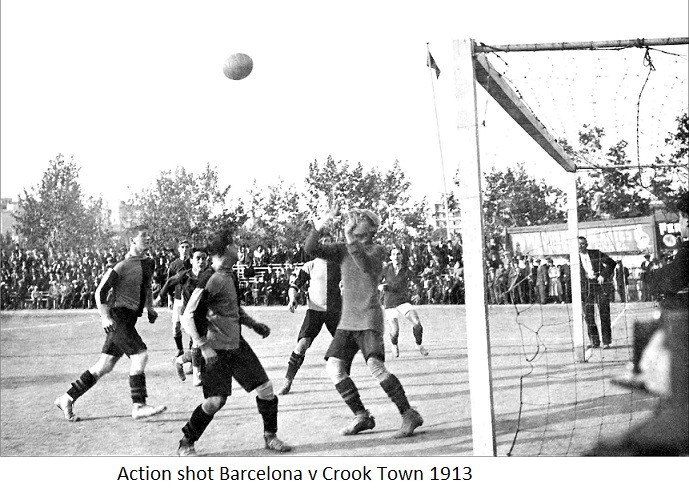 In the first game Crook came out as 4-2 winners in front of a crowd of 2,000. 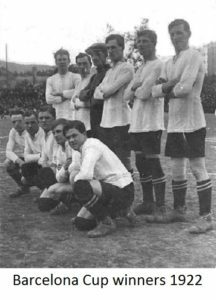 The second game finished in a 1-1 draw in front of a crowd of 7,000 and the final game finished in a 2-2 draw in front of a crowd of 10,000. 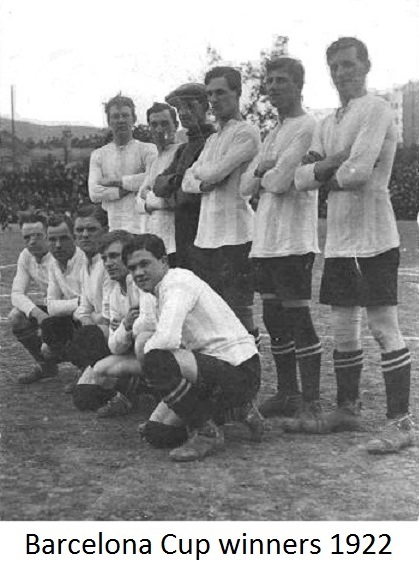 In the 1914/15 season the club finally won the Northern League for the first time in its history but the opportunity to defend that title was taken away as War was declared and the league was shut down for four years. After the War in 1919, the first competition to start up again was the Durham Challenge Cup. Crook started were they left off and reached the final that season playing against Sunderland at Roker Park. It did not end well as Sunderland who were now a Football League team, played their entire 1st team winning the game 8-0. The Northern League also re started in that season and Crook only lost out on league success during a 3 way play off with Bishop Auckland and Southbank who all ended the season on the same points. Crook also found success in the Durham Benevolent Bowl winning the trophy at Kingsway. The 1920/21 season was also eventful with Crook losing out in the Durham Challenge Cup Final to Darlington at Feethams in front of a crowd of 6,060 to a last minute penalty. In that seasons Durham Benelovent Bowl they managed to retain the trophy for the second year running beating Bishop Auckland 3-2 in front of a crowd of 7,626 at Feethams. 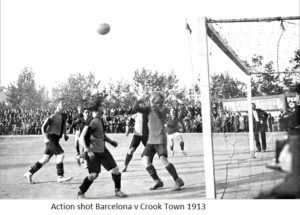 The club also embarked on its second tour to Spain playing Barcelona in a series of 4 matches who were now managed by Former Crook Town player Jack Greenwell. The tour on the field was not as successful for Crook as the last as they lost 3 of the games and drew 1. However off the field it was a raging success as all of the games drew a capacity 15,000 crowd. At the start of the 1921/22 season Crook Town could now boast crowds of 3,000 plus for all of their home games but for the final of the Durham Benelovent Bowl that season there was a crowd of 6,000 to see Crook take the trophy with a 3-1 win. 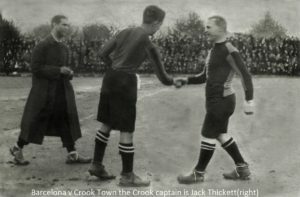 However controversy was never far behind Crook Town and due to the “robust” fashion in which Crook had played the final, the man presenting the trophy, Lt. Col. Dowling refused to congratulate Crook on their victory. Two Crook players then refused to accept their winners medals and were later fined by Durham FA for their refusal to Shake Lt. Col Dowlings hand. The club also finished as Runners up in the Northern League. 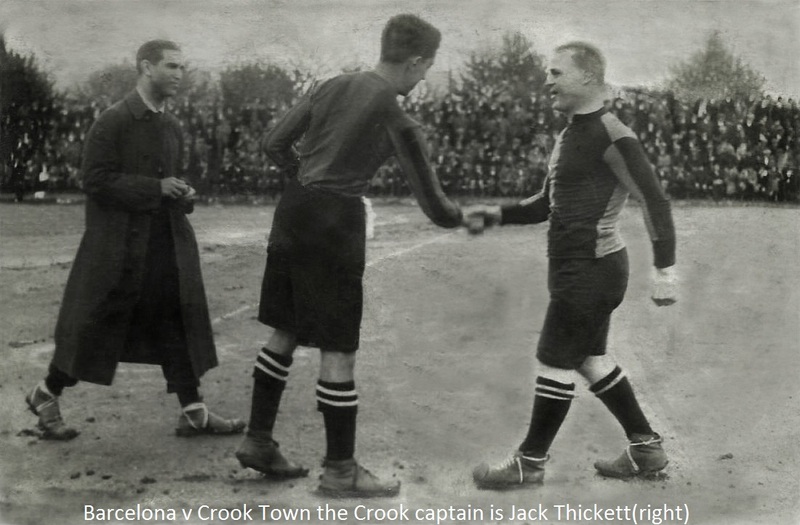 The same season saw Crook take their 3rd and final tour to Spain to face Barcelona in a series of two games. Crook lost the first 8-1 but re gained some pride with a 2-2 draw in the second. At the end of the tour Barcelons presented the Crook party with a trophy aptly named the Barcelona Cup. The 1924/25 season saw the club have another good season. The league campaign saw the club finish as runners up. However, if they had beaten Ferryhill in the last game of the season they would have been crowned champions but they lost the game by a 2-1 margin. The FA Cup that season brought all of the excitement with Crook reaching the 6th qualifying round and drawing Football League club Bradford Park Avenue. The game was played in front of a crowd of 11,000 at Millfield on the 13th of December 1924 but unfortunately it was Bradford who progressed to the next round.